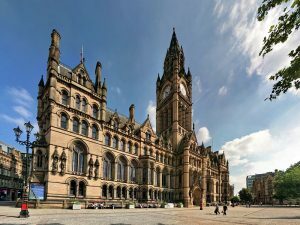 Relocating to Manchester - Why Should You Move Here? In Manchester, you can always find something to do, as this city of culture is packed with many fantastic events for all ages and interests. Manchester’s city centre consists of unique and lively restaurants, bars, shops, museums, galleries, festivals and hotels. If music is your passion, you might want to go to a local gig or concert at one of the many music venues across the city. Manchester is known for its indie/rock music, being the place where Joy Division, The Smiths, and, of course, Oasis are from! During the festive season, the city hosts an award-winning Christmas Market for those who wish to get into the magical, Christmas spirit. The Christmas Market has more than 300 beautiful stalls and chalets, where you can indulge yourself in mouth-watering international food, drinks, handcrafted gifts and more. No Manchester guide would be complete without mentioning Manchester United! This city is home to Old Trafford stadium, the stomping ground of the world-famous Premier League football team. Here, you can take a stadium tour or just visit the museum. Alternatively, if you are a fan of the beautiful game, but not this particular team, take a visit to Manchester’s National Football Museum – the world’s largest museum of its type. Manchester has excellent transport links, taking you to all sorts of destinations across the UK and the world. As such, this city may be the perfect base for you to explore other cities, as it won’t be much of a hassle. The Metrolink is Manchester’s tram system –a fast, easy and accessible way to navigate yourself around the city centre and into Greater Manchester, allowing you to escape from the busy city centre and surround yourself with a more tranquil setting. Greater Manchester has quaint market towns, traditional pubs, beautiful greenery and waterways – all within easy reach. The city has two main railway stations, Manchester Piccadilly and Manchester Victoria. These stations offer long distance services to major cities, such as London, Leeds and Birmingham, as well as regional services to Liverpool, Leeds, Sheffield and York. Furthermore, as Manchester has its own airport, you can take domestic, European and international flights, allowing you to explore the famous landmarks, countryside, history and culture of different citites. Manchester is known as the most linguistically diverse city in Western Europe. While the official language is, of course, English, there are also up to 200 other languages spoken here. Approximately one-half of the city’s adult population is multilingual, and 4 in 10 young people can converse in more than one language. On any given day you might hear around 60-70 different languages being spoken as you stroll through town! The cost of living, which includes food, housing, clothes, transportation, personal care and entertainment is, by and large, far cheaper than London. The most significant price difference would be paying monthly rent, which certainly makes a big dent in our wallets! Likewise, homeowners will find purchasing a house here is, on average, 20% cheaper than in London. So, if you’re looking to save money but experience a similar vibe to London, relocating to Manchester can be a much more sensible, economical option. Manchester is rapidly becoming one of the most important locations in the UK for research, development, innovation, academic excellence, corporate service firms, banking and financial services. Years ago, most people thought that you had to live in London to start your career, but now that may not always be the case. With a wide range of different industries, including ICT, medical, media, creative, digital, food and financial services, Manchester has a highly diverse labour pool which attracts many talented people. The city also has a thriving student population, having been consistently voted one of the UK’s best student cities. Amongst the cities’ several higher education institutions, the world-class University of Manchester remains one of the UK’s best, belonging to the esteemed “Russell Group”. Here, you can study anything from Medicine and Dentistry, to Law and Politics. The choice is yours! If you are someone who doesn’t like very warm or extremely cold climates, Manchester will be a suitable place for you. Manchester has cool winters and mild summers, where the temperature, on average, ranges from 2°C to 21°C. You may also find that there is light rainfall throughout the year and a relatively high humidity level. If you have been persuaded to finally make the move to this great city, then you need to select a removals company that is skilled, proficient and capable of facilitating all your belongings. It is important to choose a company who specialises in removals to Manchester, so the process of relocating to the city will be less stressful and handled with ease.